Everywhere you look online, there’s a link to click that leads you somewhere because we’ve been trained by Google to believe that links are necessary to rank our sites in search results. But that’s only partially true. If you really want to have good SEO and get that link juice from Google, you need to understand two things: nofollow links and follow links (sometimes referred to as dofollow links). Nofollow and Follow Links: What’s the Difference? It isn’t quite clear what they are to most people. After all, you click a link and follow it to where it points. So is a nofollow link just a link that you click and click and click, only for it to take you nowhere? No, though that would be a super funny prank to pull on your website visitors. A nofollow link is actually a tag inside the HTML of the link (rel=”nofollow”) that tells search engines that you don’t want them to click the link, and therefore you will pass absolutely no link authority to the website you link to. A follow link then, or dofollow, is one without the rel=”nofollow” tag that tells search engines to follow it and let that site know you’re linking to it. Here’s the question most people ask: isn’t telling search engines to ignore the link and not pass juice selfish? To which we answer: No, not at all. You’re really helping them out as much as yourself if you correctly set up your rel=”nofollow” strategy. So let’s look at the reasons you’d use nofollow links, how you put them into your site, and when you want to eschew them in favor of good ole, SEO building follow links. You will find a lot of reasons to use nofollow links throughout your website. They may all be in different spots, too. Let’s break down some of the most common places and why you’re going to keep search engines from using the link for SEO. If people can post links in comments, they will abuse that privilege. Especially of those are follow links. They can post a link to wherever, and your site will pass along PageRank and link juice. That is basically you vouching for the website weareabadwebsiteandwillbreakyourcomputer.com whenever someone posts a link there. You don’t want to do that. So nofollow those links. WordPress does this by default, actually. By making your comments contain nofollow links, you also help facilitate discussion because real people’s comments and threads don’t get interrupted by meaningless comments. Doing this is good for everyone. Every content creator has done it at some point or another. Linked to a site that we knew was bad news, but for one reason or another needed them for a reference. Maybe you linked an infographic from a news site that you don’t want to be associated with. Perhaps there’s a scam or hack or scandal, and you link to it as a warning to your users, but don’t want to give them any boost in Google’s eyes. So you link to them but nofollow it. They may still get a few visitors, but you aren’t providing them a permanent boost. Let’s say that you have a bicycling store. If, for some reason, you post a blog about how to bake a cake or have a page on your site advertising a local storytelling festival. You link to a ton of relevant, cool resources for that topic. However, Google may look at the overall website and assume that page has been put there against your knowledge because it’s so different from your normal content. The search engine would assume that those were part of a Black Hat link building campaign and then penalize you for that. In this kind of instance, you can add a nofollow meta tag to your header. Then all the links on the page would become nofollow. Fun fact: this is what the nofollow attribute was originally for. It was later adapted to be applied to individual links for better control. If you include sponsored content on your blog, that’s great. It’s a fantastic way to monetize a blog. We do exist in an influencer culture, after all. However, your readers need to know that the content is sponsored — and so do the search engines. Any time you have a link that is only on your website because you have been sponsored to put it there, it should not be a follow link. You absolutely, 100% need to include rel=”nofollow” on it. Even if your contract doesn’t say specifically that you have to link to any particular website, only create the content, you still need to make everything related to it a nofollow link. To a product page, to the company’s website, to a contest form, anything. They are paying for referral traffic based on your audience, not link juice based on your PageRank. By the way, this also includes affiliate links. So add rel=”nofollow” to those, too, since you’re profiting from them. Basically, if you have links in your sidebar that appear on each and every page on your site, mark them to be nofollow links. Because each time you make a post or update, a new backlink is generated, and eventually you will appear as one of the undesirables to Google. Footer links also fall into this, and, for instance, you run a design agency that links back to your home page on each client site, you may want to think about nofollowing it. People can still click the links, but you avoid Google penalties at the same time. There are a few times when you may actually want nofollow links on your site. Well, maybe not want them, but prefer them to the alternatives. For instance, if you have the low-quality website weareabadwebsiteandwillbreakyourcomputer.com linking to you 3,000 times, that makes your website look suspect. Or if you have 50,000 different websites linking to your site with sidebar links on every page, you look suspicious because most of those pages aren’t relevant to your content. Plus, they’re identical. Google’s Matt Cutts says in no uncertain terms that nofollow links will not hurt your rankings. They can only do that if you’re working on a spam campaign on a massive scale. He gives a quick rundown of why and how nofollow works in this video. If you get linked on a major blog or news outlet or YouTube channel (all outbound links on YouTube are nofollow), they probably have themselves walled off against Google’s punishment by using nofollow across the board. But just because they aren’t passing along their massive volume of link juice doesn’t mean they aren’t helping you. Organic traffic is how you create an audience, engage with your users, and really establish yourself. Referral traffic from a major source, nofollow or not, is only going to help you. If you want to find out if an individual page has follow links or not, it’s actually very simple to do so manually. Just right-click anywhere on the page that is not a link to bring up the context menu. Select View Page Source. That will open up the page’s source code, and you can do a search by pressing CTRL/CMD – F and typing in nofollow. Any links that have the attribute will be highlighted for you. This method works great if you happen to find a link to your site in a particular blog or article. It’s a quick and easy way to check for nofollow links. But unless you can manually scour every single page of the internet and look at their source code, you will need a tool specially designed for that. 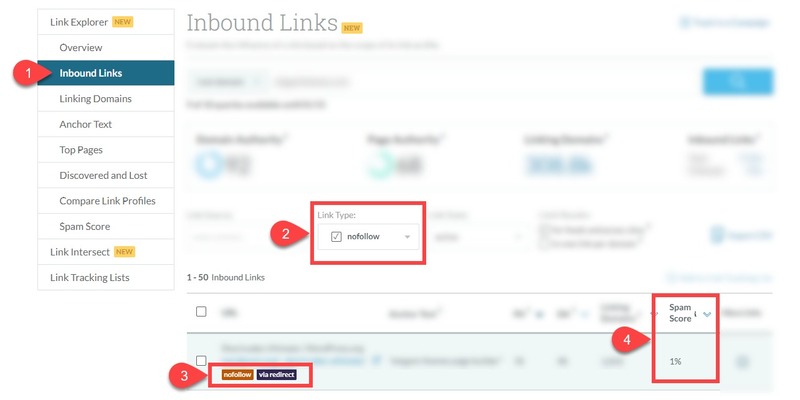 Moz’s Link Explorer is one of the best ways to check to see how many of your inbound links are tagged. While the Moz Pro service is premium, you can get 10 URL queries a month with a free account to check on your site. Using a service like this (Ahrefs is another great one), you can keep track of who is pointing in your direction. Also, you can use the dropdown to see which are the most popular and useful follow links heading your way, too. If, somehow, you find that you are being penalized because of a high amount of links from a few sites, you can always petition Google through the Google Search Console to simply discount those links. So if you think you should have nofollow links, you can essentially get them this way. Setting up nofollow for individual links is pretty easy. In general, any page or post you create — regardless of platform — will give you the option to view/edit it as HTML. It may simply be called the Plain Text version or something similar. In WordPress, depending on your editor, it will either be called HTML (for Gutenberg) or Text (for the Classic Editor). Drupal, Joomla, etc. will all have similar functions. When you see the code for the page or post, you just add rel=”nofollow” into the a flag as in #2 in the image below. No link juice would be passed to Moz. If, however, you look at #3, you have nothing impeding Ahrefs from getting the juice. Adding the nofollow tag really is that simple. Just type it in. If you prefer not to even mess with code that much, there are plugins and extensions to do this for you. On WordPress, you can add the attribute on a link-by-link basis with a plugin like Ultimate Nofollow. It’s a visual checkbox in the normal link-editing process. 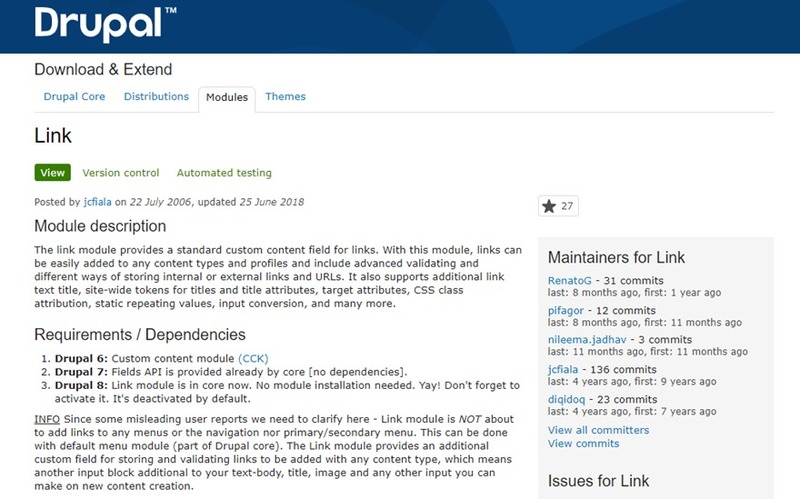 On Drupal, you get the simply titled Link. As you can see, it’s not hard to toss in the attribute to your follow links to turn them into something the engines ignore. Now that we’ve covered the gamut of nofollow, let’s take a quick look at the dofollow links that will still likely make up the majority of your website. To use follow links, all you have to do is not add nofollow. There is no follow attribute for HTML. They are all follow links by default. It takes something stepping in for it to become nofollow — such as WordPress defaulting comments to nofollow. In general, you want follow links to be the norm. So you will want to use them the majority of the time. Keeping your links open like this will let search engines more accurately map your website and develop a sitemap — keep those internal links dofollow, remember. Also, most of the time you want to keep external links in the body of your content as dofollow. You would only want to mark them nofollow in the instances we discussed above. Because the internet is a social place, and we need to help each other out. That’s why Google prioritizes links into PageRank as highly as it does is. They want us to link out to other places. They just want us to link conscientiously and mindfully. Google wants us to share content that is relevant to readers and provides real value. If you’re creating content in a normal way, conscious of which sites you link to, and don’t try to game the system, follow links by default are definitely the way to go. Links are the backbone of the internet. The whole web as we know it is based on hyperlinks, and we need to be sure that we’re treating them well so they treat us well. They increase your PageRank and provide juice to the target site. Links drive back-and-forth referral traffic. And your readers have content and resources that they will want to click on. When used the way they are meant to be used, both nofollow links and follow links are tools that serve specific purposes at specific times. And now you know what those are. What is your nofollow strategy for your website? The post How and When to use Nofollow Links and Follow Links appeared first on Elegant Themes Blog.